The news of Daae moving up was accompanied by some other good news for the Prowlers. The Prowlers would like to welcome back former league MVP and the Prowler franchise's leader in goals, as well as points, Matt Robertson. Robertson's return is great news for the Prowlers, who have started out slower than they'd like this season . “Robo is a leader on and off the ice and will definitely add some goal scoring that we have been missing up front so far. Its a huge addition not only on the ice but to the locker room”, Pace stated. 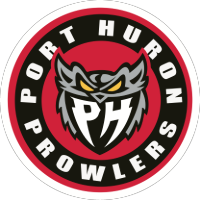 Matt Robertson and the Port Huron Prowlers will be on the road the next two weekends, but fans can catch them back on home ice December 14th against the Mentor Ice Breakers and on December 15th against the Watertown Wolves. Both games are slated to begin at 7pm. A Teddy Bear Toss will take place on Saturday night, as the team has partnered with the Salvation Army. Bring your stuffed animals and toss them onto the ice after the first Prowlers goal! Both games are slated to begin at 7pm. To get your full season or individual game tickets stop by the McMorran box office.